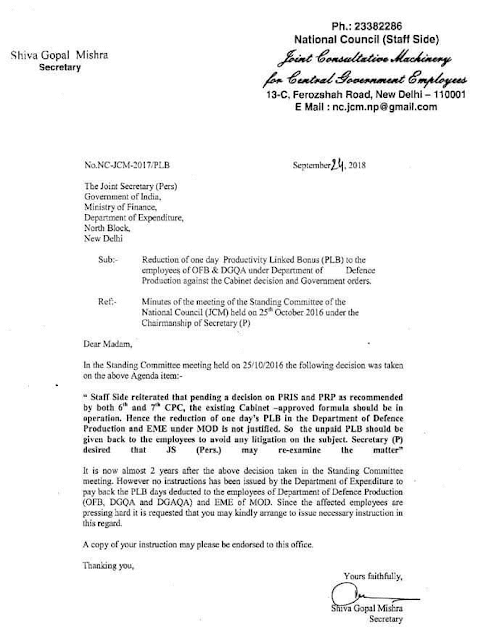 Sub:- Reduction of one day Productivity Linked Bonus (PLB) to the employees of OFB & DGQA under Department of Defence Production against the Cabinet decision and Government orders. Ref : Minutes of the meeting of the Standing Committee of the National Council (JCM) held on 25th October 2016 under the Chairmanship of Secretary. "Staff Side reiterated that pending, decision on PRIS and PRP as recommended by both 6th and 7th CPC, the existing Cabinet approved formula should be in operation. Hence the reduction of one day's PLB in the Department of Defence Production and EME under MOD is not Justified. So the unpaid PLB should be given back to the employees to avoid any litigation on the subject. Secretary (P) desired that JS (Pers) may re-examine the matter"
It is now almost 2 years after above decision taken in the Standing Committee meeting. However no instructions has been issued by the Department of Expenditure to pay back the PLB days deducted to the employees of Department of Defence Production (OFB, DGQ and DGAQA) and EME of MOD. Since the affected employees are pressing hard it is request that you may kindly arrange to issue necessary instruction in this regard. A copy of your instruction may please he endorsed to this office.